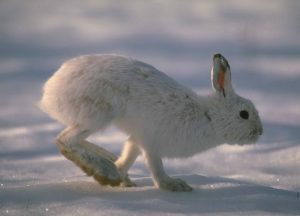 July 19, 2018 – Although the Attorney for JLCAR (the committee) stated in the JLCAR July 19 approval of biennial rules report that JLCAR may object to the snowshoe hare rule if they consider it violates the NH Cruelty Statute, the committee Chair, Senator Reagan, stated to the public that it is an issue better challenged through legislation. The committee unanimously approved the NHFG 2018 biennial rules which included the expanded rule that allows beagle clubs to capture wild snowshoe hare and use them as live dog training tools. We will continue to fight for NH’s wild snowshoe hares. a limited season on fox trapping and hunting because of the sharp decline being seen in the population was in proposal. Feb 14 Commission meeting- initial rule proposals approved and Hearings for public comment in Lancaster, Keene, Concord were scheduled March 30-April 3. Public comment period opened. NHFG received around 100 comments on the rules, 60 of those against the hare rule and none in support of the hare rule. Please read how the hare caused a stir in the media. June 15 the Joint Legislative Committee on Administrative Rules (JLCAR files a preliminary objection to all the biennial rules saying the rules were not in the public interest because public comment was not fully considered. June 20 NHFG Commission held another public comment hearing in Concord. changed its position from April 15 on the fox rule. Decided to keep seasons the same, no limits, with much discussion and disagreement with the staff biologists. kept its position on the snowshoe hare rule with no discussion. July 19 upcoming meeting- Please attend this JLCAR meeting on July 19 at 9 AM in the LOB, Rooms 306/308. Key people will speak, but we need all of you there for support. The Joint Legislative Committee on Administrative Rules (JLCAR) provides legislative oversight of state agencies, including NH Fish and Game, in its administering of rules. JLCAR is composed of NH Senators and Representatives. On Friday, June 15, JLCAR sent Fish and Game back to the drawing board. They made a preliminary objection to all of the wildlife seasons biennial proposals. This gives us another opportunity to comment on the two issues of the Snowshoe Hare Live Trapping Rule and the Trapping of Fox Rule. It is now time to write JLCAR again. Please write at least a few days before the July 19 meeting so they have time to read and discuss comments. Make sure to use your full name and town in your email. Street address is optional but the trappers are telling the lie that comments are coming from out-of-state. If you commented in the past THANK YOU! Your comments are working but please comment one more time. We NEED YOU TO Write JLCAR, asking for a final objection! to end the NH Fish and Game Rule that allows beagle dog clubs to capture NH wild snowshoe hare, keep them in captivity and use them as training tools. The beagle clubs stock their property with the captured hares and then let groups of beagles chase them. This is a recreational activity called hare field trials. Awards of ribbons and trophies are given. They say the beagles don’t catch the hares but even if that is true, that it never happens, this is still cruelty. Read Dr. Taylor’s comment letter. If the snowshoe hares belong to anyone, they belong to all of us, human and non-human. Snowshoe hares should not be taken from the wild and used by private clubs for their private entertainment. Below, 1-4, are some of the comments made through the public comment process, indicating that the snowshoe hare rule is a violation of NH’s cruelty statute. NHFG failed to fully consider or even discuss these and other comments in its meeting of July 2. When a state agency fails to consider public comment JLCAR may object to the rule on the grounds that it is against the public interest. The snowshoe hares are captured and stocked, often far from their homes, on beagle club fenced in properties of 50 to 100 acres that is quite possibly unsuitable hare habitat. Relocated animals must find new shelter in an unfamiliar environment and they must do it while avoiding prey. Although they are fenced in, club owners readily admit that predation is happening from hawks and other birds of prey. The clubs release groups of beagles on the properties to chase the hares for what they call hare trials. As is commonly known, the sustained flight response in a hare can result in death. For training purposes, they put a young beagle in a smaller enclosure with a hare. The hare, being a flight prey animal is terrorized, but unable to flee. The clubs are attempting to propagate the hares but with little success, as is seen in the propagation reports they are required to submit and that we have seen. That the hares don’t breed as would be expected is an indication that there is a problem with their care and/or their environment. Wild animals in captivity, such as NH snowshoe hares, are protected in the NH Cruelty Statute. The significant decreases in the populations of furbearing predators, such as the foxes, can have extensive negative consequences to the ecosystem. With fewer predator populations, species such as rodents, chipmunks, etc., can experience dramatic population increases. For instance, an increasing rodent population provides many more potential hosts for ticks that can carry Lyme and associated tick-borne diseases. Please read Dr. Taylor’s letter. Bobcat hunting and trapping ended because of a population decline. Pine Marten in NH has a closed season because of it. Now it is time for the fox to be given similar consideration and protection. NHFG Commissioners claimed that the data that sited that the population of foxes is seeing a sharp decline is inconclusive. This is the data the department has used for 30 years to set seasons. The Commissioners went against the advice of the NHFG expert biologists and removed, in the rules package, any limits on trapping or hunting foxes.